Climber, explorer and vagabond for adventure Angela VanWiemeersch takes it all one step at a time. Angela VanWiemeersch’s adventures have taken her from ice skating in Michigan to studying fashion design in college, to cycling across the country to mountaineering around the world. Photo by Scott Adamson. 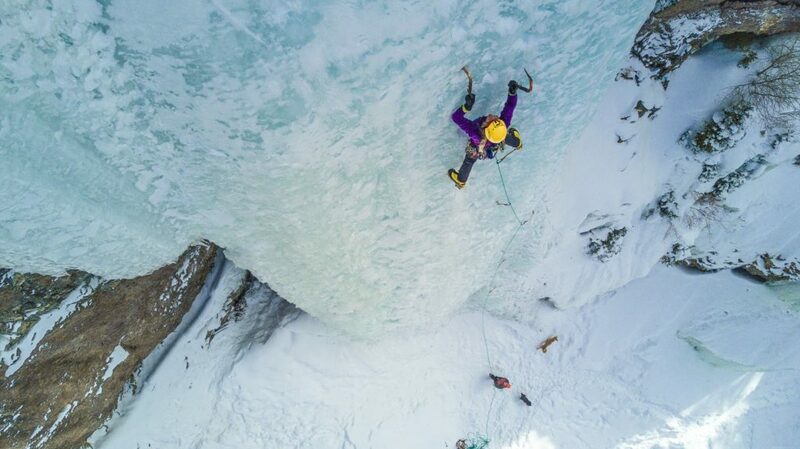 A former competitive ice skater with a background in fashion, Angela VanWiemeersch was 22 years old when she learned about ice climbing. 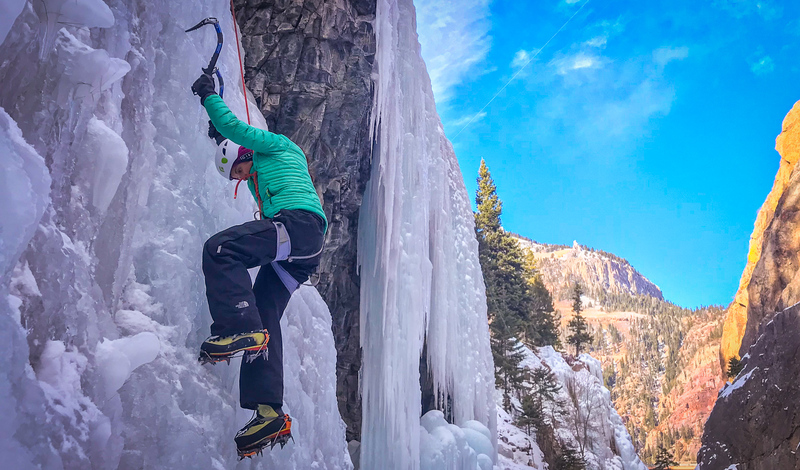 Not only did the sport of ice climbing find VanWiemeersch, it literally picked her up and took her straight to the epicenter of it: Ouray. 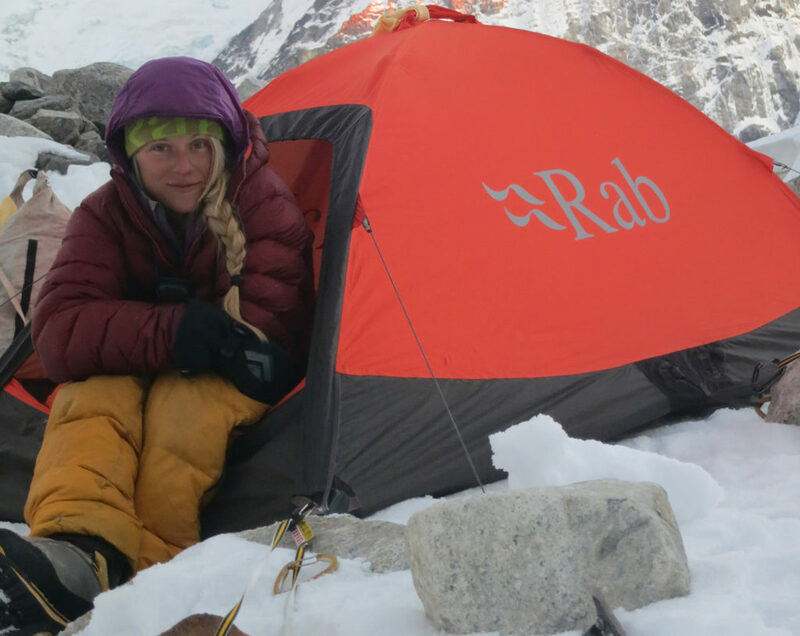 Her career trajectory in a sport she picked up six years ago affirms her dharma, from her discovery of ice to first ascents everywhere to traveling the world to challenge unclimbed peaks. 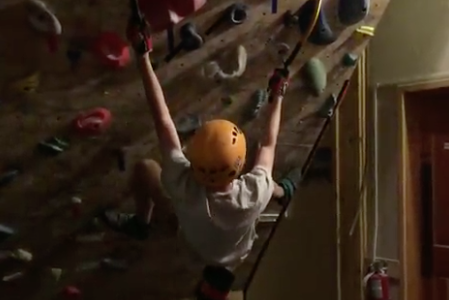 A new challenge for VanWiemeersch is mentoring a rock climbing prodigy, Sasha DiGiulian. 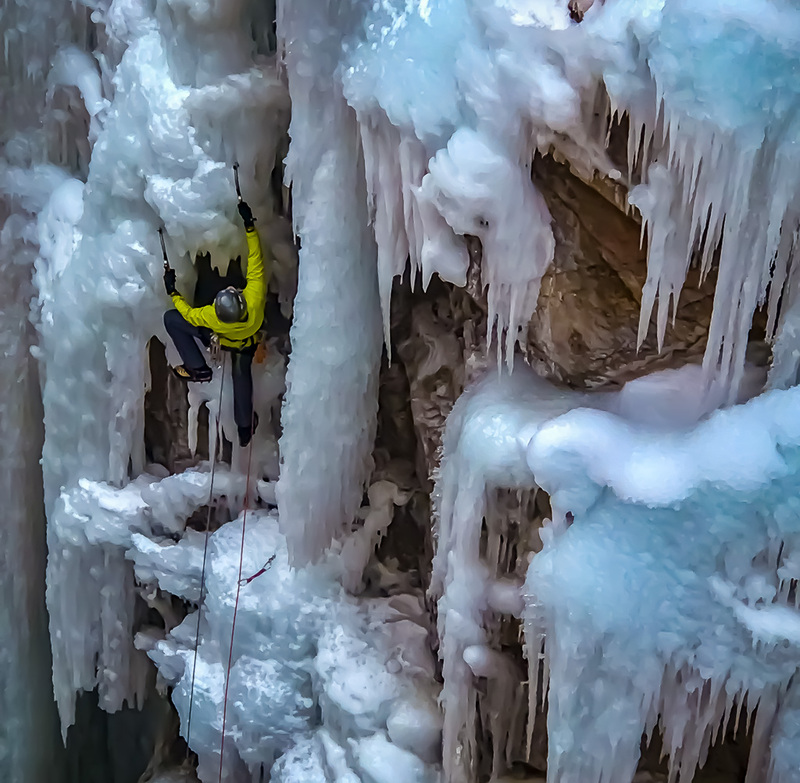 One of the most accomplished rock climbers in the world, DiGiulian was getting into ice, and VanWiemeersch was going to lead the way. The partnership nurtured a mutual respect, inspiration and willingness to learn that also revealed her personal growth and progression within all genres of the sport. Southern Utah has some of the best ice no one has ever heard of. Photo by Andrew Burr. While VanWiemeersch’s life is always on the go, her adventure itinerary usually sends her back to the Southwest where she is loosely based somewhere between Colorado’s Western Slope, Provo, Utah and Zion National Park in southeast Utah. And while Zion is on all climber’s tick list, they’re all gone when she shows up. 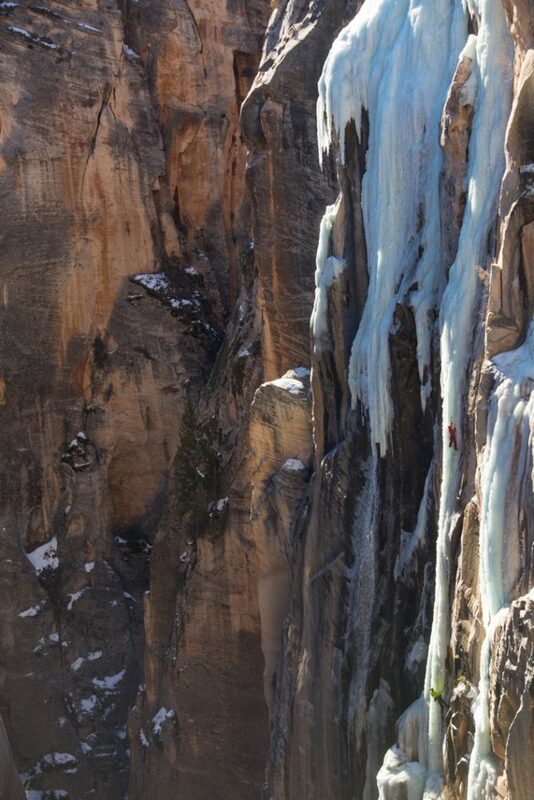 Ice routes in southern Utah’s Zion National Park were the subject of myth until 2013 when VanWiemeersch and the late Scott Adamson stomped around the desert looking for frozen water. “We put in such long days, waking up at 4 a.m. over and over, skiing and hiking – sometimes 16 miles for a single climb. 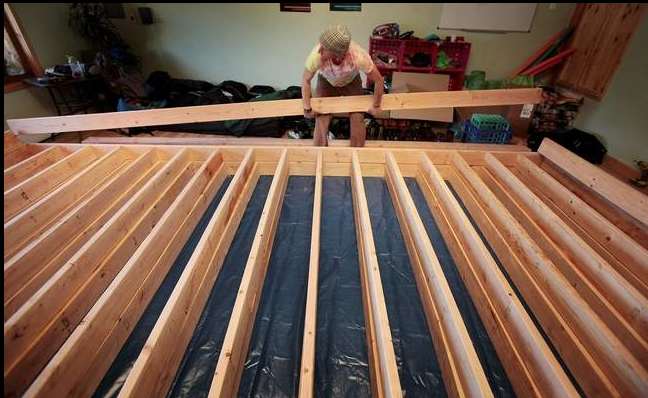 But the hard work paid off,” she says. The trailblazing mission is archived in “Desert Ice” , A Three Strings/ARC’Teryx Production. Over the next two years, the two returned with more climbers, establishing more desert ice routes. 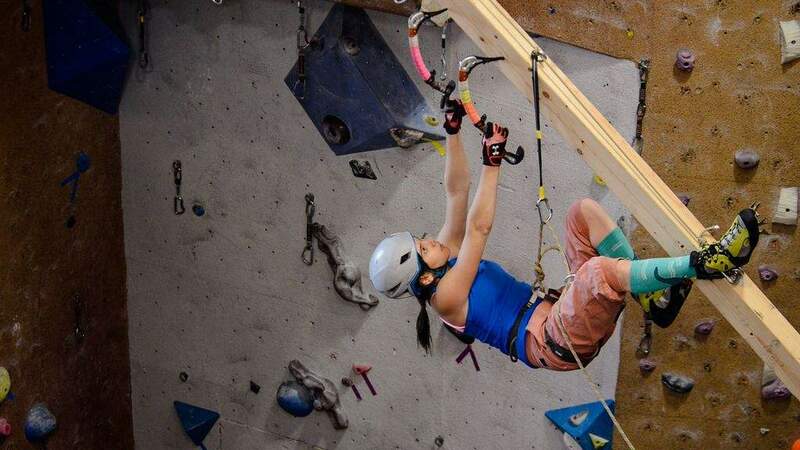 “It was the most memorable, beautiful and special climbing experience of my life,” she says. How does Angela VanWiemeersch do it? One kick, one swing, one step at a time. Photo by Ari Novak. Winter 2018 and 2019 brings plans to chase new challenges from New England to Central Alaska, plus plans she’ll keep under wraps for now. So, how does she do it all?